You already know about the health benefits of having a humidifier in your home, but you might not know about the benefits of a PureGuardian humidifier – and specifically an ultrasonic one. As you know, a humidifier can ease the symptoms you or your family may suffer during a particularly dry winter or from living in a dry climate, such as coughs, sore throats, congestion, excessive snoring, and dry, cracked skin. In addition to the drier air outside, your furnace or air conditioner could be contributing to drier air inside your home, which is why so many people choose to run a humidifier in several rooms of their house. 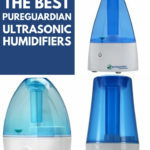 Be sure to read the best PureGuardian ultrasonic humidifier reviews, too, where you can see what others think about these units that are helping people slough off the dry air effects. Why Buy a PureGuardian Ultrasonic Humidifier? Is an Ultrasonic Humidifier Better Than the Others?